Marquise de Livry was the daughter of Gaspard de Maniban who ran huge properties in the Armagnac area after his father Jean Guy de Maniban. Both of them were President of the Parliament of Toulouse in the 17th and 18th centuries. Marie-Christine de Livry inherited the properties in 1762. She got married to Marquis de Livry, great Chamberlain of King Louis XV. This position helped her to introduce Armagnac to King Louis XV..
She lived in the Royal Court of Versailles, nevertheless she used to come back every summer in her two properties in Gers. She enjoyed spending time in her Castle of Mauléon d’Armagnac in the Bas Armagnac area, roots of her family. The property of 3000 ha which at that time went from Cazaubon to La Bastide d’Armagnac where a street was named after her family name “Maniban”. Note that in La Bastide d’Armagnac, King Henri IV owned a House and took inspiration from the place to build La Place des Vosges in Paris. Today, Marquise de Livry’s estate located in Mauléon d’Armagnac belongs to the Castarède Family, settled in the Armagnac area since 1832. Our House owns the most important collection of old vintages.The majority is kept in our storehouses, quietly waiting for the delicate moment of bottling. A collection of bottles relative to the last century years (from 1893 to 1996) . 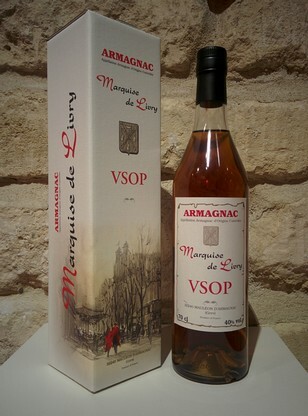 The youngest of our Amagnacs Marquise de Livry aged minimum 2 years in wooden oak cask (more than the minimum legal age which is 1 year old). More powerful and aromatic, it can be served with ice as a pre-dinner drink or as long drink with a tonic or a fruit juice of your choice. 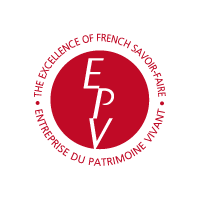 Our VSOP is a blend of eaux de vie which have aged minimum 8 years in oaken barrels in our cellars. Its robe is amber, clear and limpid. Its nose is very natural and has a great and surprising freshness. The mouth is also very fresh with some touches of prune aromas. 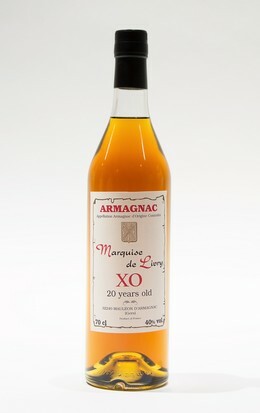 The appellation XO means minimum 6 years old, our Armagnac Marquise de Livry aged minimum 20 years old in wooden cask. Its robe is clear coppery. It has animal flavours like fur and leather. 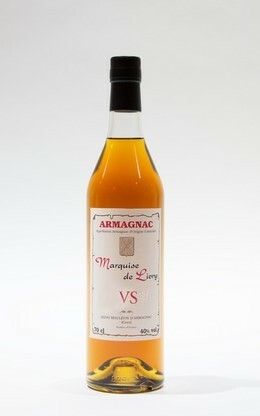 This Armagnac has a smooth attack, very agreeable. It also has pleasant aromas of ripe prune and spices without any asperity. It is very well balanced and thanks to its numerous qualities it has been awarded several times.